Growing up in the beautiful wine country of Santa Rosa, California, Aerianna Mendoza moved to Sacramento ten years ago in order to attend UC Davis. After graduation, she got a job in the area and has lived there ever since. "I have grown to really like Sacramento, I especially enjoy riding my bike down to historic Old Sacramento to shop and eat. Eating is one of my favorite things to do!" Aerianna said smiling. Her bear making started completely by chance. "While standing in line at a local craft store one afternnon about four years ago, I noticed a book in the bargain bin on how to make teddies. 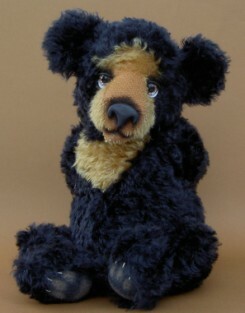 I have always loved bears and thought it would be fun to try to make one." Having already acquired a passion for sewing stuffed animals as a child, she figured she would give bear making a try. "Of course," Aerianna continued, "after the first bear, I was hooked!" Soon after that, she discovered there was a whole community of bear enthusiasts. Inspired by several artists, she recalled, "I had no idea that bears could be so beautiful." With some prodding by a friend and her husband, she officially became "aerBears" and started making and selling one of a kind teddies. "My dad called me 'Aerbear' when I was a little girl and that name has always evoked a warm, fuzzy feeling. Aerianna makes 3-4 bears a month from the patterns that she designs. Most of her bears are naked, but once in a while, she designs and sews clothes for them. 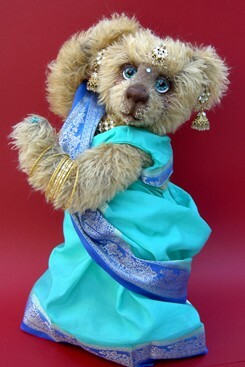 Drawing inspiration from the 'Bollywood' India acting community, her most elaborate outfit to date was on her bear, Aishwarya. "I made her sari and her jewelry was adapted from, Indian jewelry which I took apart and reassembled to fit her," she remarked. 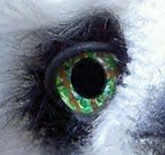 What adds Aerianna's personality to her bears, are the eyes. 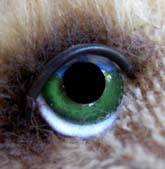 "One day, while photographing a bear up close, I noticed a reflection of my house in the bear's eyes," she recalled. 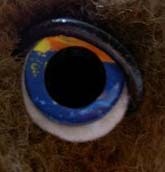 "I thought it would be interesting if the bear's eyes reflected what I thought they were looking at. I started experimenting with different techniques to paint scenes in their eyes." With her focus on the eyes, Aerianna feels it's important that the eyes look one color at a distance and that details only start popping out when you look very closely. 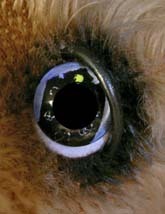 "The eyes are designed so the viewer can gaze into the bear's eyes and join them wherever he or she is." 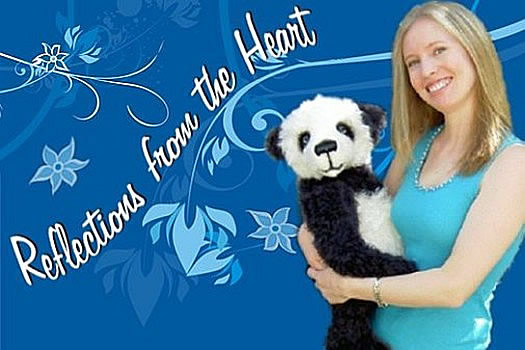 Aerianna sells primarily from her web site, from a mailing list and the occasional bear show. "I am so pleased to be able to participate in this rewarding business," she stated. "Everyone I have dealt with in this industry is encouraging and incredibly kind. I am so thankful to all the collectors, too, who make it possible for me to continue doing something I love so much!" Professional Members can view Aerianna's photography and web site tips by logging onto B2B Professional Members section. 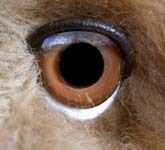 Buttercup's eyes reflect a field of flowers in cornflower blue. are reflected in her eyes.